Fredericton Commencement: Tuesday, Sept. 5, 10:15 â 11 a.m. | Richard J. CURRIE CENTER The UNB Fredericton campus community will gather on Tuesday, Sept. 5, to welcome new students to the university and officially mark their entry into higher education. Host UNB President Eddy Campbell will induct new students into academia in this special ceremony. Freddy Beach Welcome BBQ: Thursday, Sept. 7, 6 â 8 p.m. | Officerâs Square (585 Queen St.) Join in the fun as the whole city welcomes students to Fredericton. UNB students will get to walk the red carpet, enjoy live music and activities, mingle with new and old friends, and grab some grub. Shinerama: Saturday, Sept. 9, 8 a.m. â 3 p.m. | Starts at the Student Union Building (SUB) Cafeteria and moves to other locations in Fredericton Shinerama has been a UNB tradition for 45 years, with students at UNB contributing to the more than $25 million raised to support cystic fibrosis research in Canada. Shining shoes, washing cars, busking and barbecuing â these shiners do whatever it takes to fundraise. 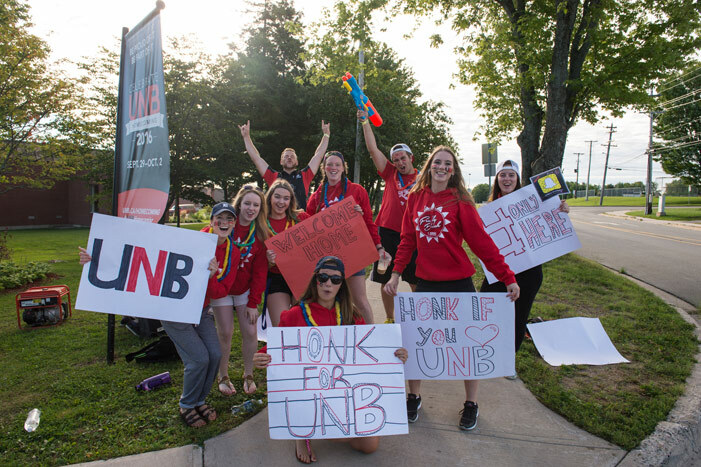 Saint John Shinerama: Wednesday, Sept. 6, 11 a.m. â 3 p.m. | Market Square, Uptown Saint John A yearly event at UNB Saint John, Shine Day sees first-year students spread across Uptown Saint John raising funds for and generating awareness about cystic fibrosis. Approximately 35,000 students at more than 60 universities and colleges across Canada participate in Shinerama, making it Canadaâs largest post-secondary school fundraiser.